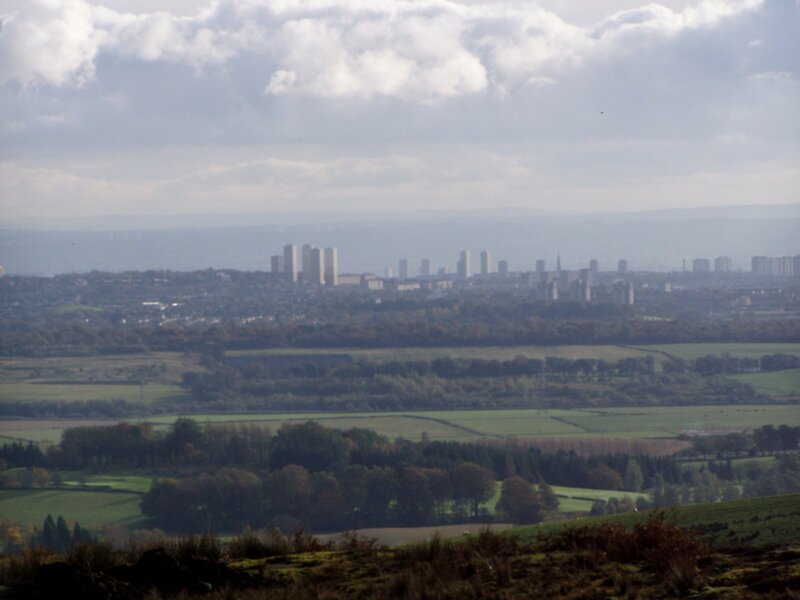 Now for something completely different… While walking in the countryside around Baldernock yesterday, Rona and I were approached by two people new to the area who were trying to find the “Auld Wives Lifts”. I laughed, saying they were asking the right man as it happened, but in retrospect I never explained to them why (although I did give them first class directions on how to get there). The Auld Wives lifts feature quite heavily in my first novel “Ultrameta” where they appear under the pseudonym (a pseudonym for rocks!) of the “Devil’s Anvil”. But what actually are they? Well, the short and weird answer is that nobody is quite sure (or can agree) on what they are, what they were for, or how they got there. But the long explanation is a whole lot more interesting. 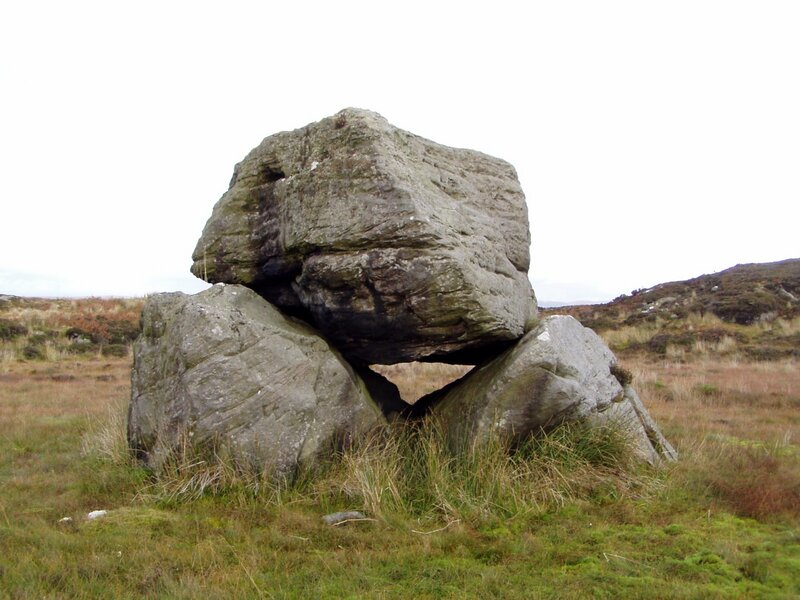 The “Auld Wives Lifts” are an ancient configuration of three large stones, one balanced on top of the other two, located in a natural amphitheatre or hollow (or was it quarried out in Neolithic times?) on a bleak moorland called Craigmaddie Muir about a mile due north (and slightly east) of the parish of Baldernock (a place one can’t even call a hamlet, never mind a village, but a very beautiful and ancient diaspora of houses and an atmospheric little church). As well as many carved graffiti by Victorian tourists, the rocks bear some very sinister carved ‘green man’ faces which are believed to be extremely old. From my own inspection I would say that these faces were once 12 or 13 in number, but that they have worn away on the weathered (south-west) side of the stones. I also believe there is a very faint Pictish hunting scene on the East face, although I haven’t managed to convince anyone in authority yet. There is said to be a ‘drain’ on top of the stone, through which spilt blood would have been channelled. The site was one surrounded by a circle of yew trees, and the hallucinogenic variety of mushrooms grow in the vicinity to this day (all these being Druidic clues). Let me say right now, that even in a country like Scotland which has more than its fair share of creepy places, the Auld Wives and their setting is one of the most uncanny, unsettling, and powerful places I have ever visited. If you think the phrase “sends shivers up my spine” belongs only in hackneyed ghost stories, then perhaps it’s time you re-calibrated your consciousness with a visit to the Wives. If you do so, please follow the advice that I gave to those two strangers yesterday: approach only from the east across the high dry ground, thus preserving the privacy (and muddy tracks) of the farmer who lives next to the site. That way you will also pass four chambered cairns and the remnants of a stone circle with (incredibly) the traces of a WWII gun emplacement in the middle of it. The cairns are well –documented but the stone circle is to this day, as far I know, unacknowledged by RCAHMS or any of our other archaeological bodies. Such is the irony of a site as close as this to a major city like Glasgow: very few people know about this place or ever visit it. If it was in rural Perthshire or Kilmartin it would probably have a visitor’s centre and interpretation centre by now, along with a café selling coffee like black tar, some ill-mannered staff and a toilet whiffing strongly of pee. God forbid. All of the above is doubtless why I haven’t posted on this subject before, and even changed the name of the Auld Wives within my book, to prevent the monstrosity of ‘progress’ from mobbing this very mysterious place. Truth be told, I still have some reticence in writing this now. In the years since I published ‘Ultrameta’ (2009), internet interest in the Auld Wives Lifts seems to have ballooned (presumably unconnected with my book or I’d be rich by now! ), and a good side of this is that additional data on them can now be found online, including old photographs and drawings like these I inset here. In ‘Ultrameta’ I speculated that the Auld Wives and their setting were a Pictish equivalent of the Roman forum to the druids who worshipped there, a site of great religious significance at which human sacrifice probably took place. This is not far-fetched. Julius Caesar documents in some detail the bloodthirsty rites of the druids that he encountered in Britain and it would be naïve of us to believe that the excesses of the Aztecs and Maya have occurred at only one time and place in human history. More likely, they are an archetype which has recurred often in human pre-history, and pre-history is certainly what the non-written culture of the Picts and Druids could be described as. This I suppose is where we verge into matters of rationale versus instinct and intuition. I can only say that when standing at the Auld Wives Lifts, one’s hair stands on end, and the feeling is one of enormous menace, like standing too close to an electric sub-station or nuclear reactor. It’s pathetically irrational of me to say so, I know, but one feels certain, to put it simply, that bad things happened there. Some geologists propose that The Auld Wives are an ‘erratic’: a chance configuration of boulders left by a glacier. This is surely much more idiotic than my emotional little rambling in the paragraph above. Just look up the word “dolmen” in Wikipedia and you will find that ancient stones of this kind can be found all over Ireland, Europe and Asia, some at least 7000 years old, and all mysterious in their function. Incredibly, Korea (!) apparently has the highest concentration of them in the world. What are we to make of an ancient culture lost completely to our collective memory and yet so widespread? In ‘Ultrameta’ I further speculated on the proximity of The Auld Wives Lifts to the Antonine Wall and the possibility that the visiting Romans would have found the place as worryingly powerful as some of us still do. The name “Auld Wives Lifts” being in Scots is clearly a late medieval invention, Auld Wives being witches and the joke being that they threw the stones there. In fact, one need only use basic linguistics to work out what their older name might have meant. 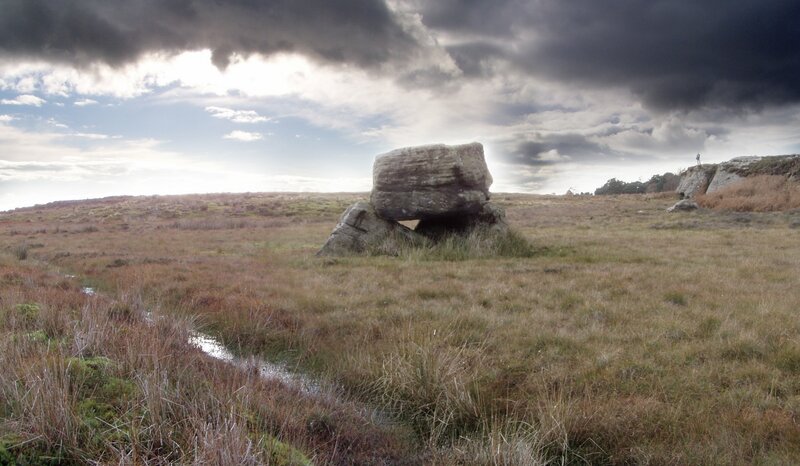 ‘Craigmaddie’ translates from the ancient tongue as ‘rock of god’, and we need only think of the importance which masons held in our society until relatively recently, to imagine a world where those who could quarry and carve standing stones were revered as intermediaries with the divine and the places the stones came from venerated and protected. Craigmaddie Muir geologically, is mining country. 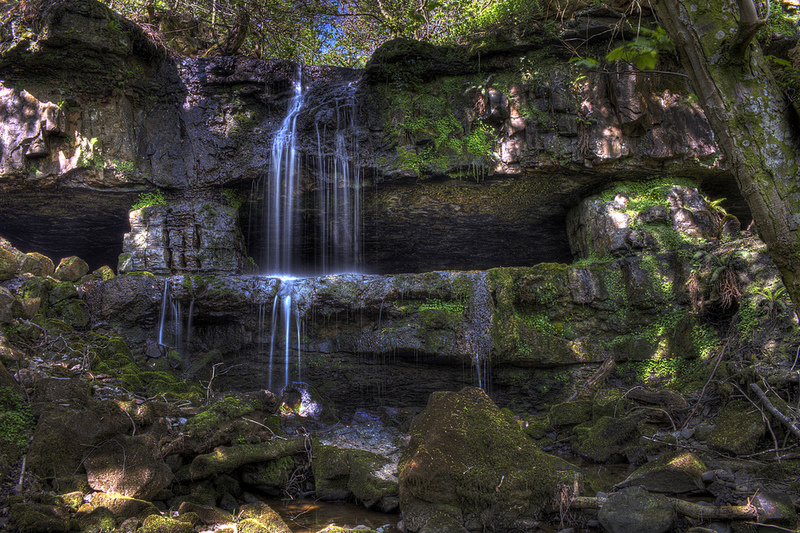 I’ll leave you with a photograph (duly credited to David C Laurie) of the nearby Linn caves. My brother Robin and his friends explored this cave using string when they were seventeen year-olds (on no account should you attempt this!) and found the passageways led into the hillside for something approaching a quarter of a mile, without finding an end. No doubt our geologists will tell us this is just a cave. But a child could tell you it is also a quarry, probably a heavily-worked one, even Neolithic. One expects Lara Croft of Tomb Raider to come bounding out of it at any minute. No doubt, it would have made a good hiding place from the Romans too. This entry was posted in Archeology, Art, History, Photography, Short Stories. Bookmark the permalink. Hi Douglas, I just found your article on the ‘lifts’ – even though it was a sunny day when I visited the atmosphere was very eerie. It’s a great place for your imagination to run wild. Hi, love this post. Are you aware that on the winter solstice (21st December and the days surrounding this), if you face west, the sun sets exactly behind the rocks and shines through the small gap in the middle of them. At sunset, the rocks produce a long shadow of light which stretches towards the Campsies and a streak of sunlight runs through the shadow (from the opening in the rocks). Awesome! Sounds amazing, Gus. Did you get a photo of that by any chance? Thanks for getting in touch.